After completing a career assessment, discussions with my career transition clients quickly shift to the question, “What’s next?” To help show them their likely range of options, I always share the graphic above. Together we retrace their career history and discuss where most of their successes, challenges, satisfactions and frustrations have taken place. With the aid of this graphic, it becomes clear where on the organizational life cycle their career highs and lows have occurred. In this blog, I’ll begin by walking you through this organizational life cycle model and the most common characteristics of each stage. You will then be able to track where you have found the best fit historically. You will also be better prepared to decide where you would like to make your next career move. Organizations begin as formative entities. In their earliest stages, they tend to be led by individuals who have a burning passion and a powerful vision. The leadership scale is usually weighted heavily towards creativity over control. 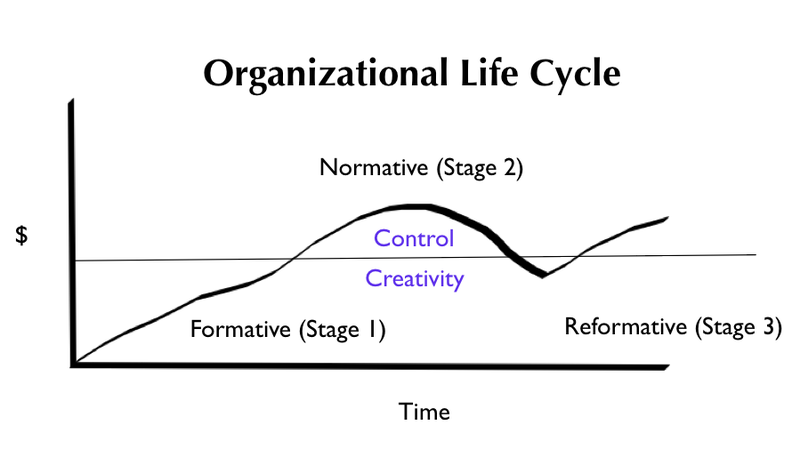 Note the dividing line at the center of the graphic above, suggesting that creativity dominates stages one and three (below the line), and control dominates stage two (above the line). As their business grows, formative organizations typically rely on limited resources and clever ways to keep the wheels on the bus as they continue to evolve. They are similar to the low flying small airplane with a bush pilot at the controls. They operate with much greater immediate risk than their larger (metaphorical) counterpart, the commercial airliner. For the small business, false moves or unexpected threats can have dire consequences. Risk usually levels off with higher altitude and positive momentum over time. As the formative organization approaches higher economic milestones, it will likely be an acquisition target. Investors or larger entities will hope to benefit from its success, and transform it to an even higher flying entity. Think large airplane with many passengers and a large crew, flying high with more routine and predictable routes, and less vulnerability to short term threats than its “formative” counterpart. Control is typically valued more than creativity, but in healthy large organizations there is the expectation that both elements remain strong. The best normative businesses are excellent teaching organizations with sophisticated people, resources and systems. Along with this complexity and large number of employees, however, comes the expectation for increased political savvy, more consensus building and the narrowing of role scope. Compare this to the formative organization’s more hands on, rapid decision cycles and overlapping of role boundaries. When you see the organizational growth curve transitioning from growth to flattening to decline, denial or basic adjustments might delay aggressive action for a while, but at some point there will be a mandate to turn the business around. This is where the organization typically needs the creative, disruptive force delivered by individuals within or outside the organization who can bring back the growth curve. This life cycle discussion brings to mind some insights from a book I read several years ago, Barbarians To Bureaucrats, Corporate Life Cycle Strategies, by Laurence Miller. Miller’s main point is that businesses are started by barbarians and prophets, and are too often taken over, and eventually taken down, by administrators, bureaucrats and aristocrats. In order to rescue the organization from the decline brought on by these three players, the barbarians and prophets must reenter the picture to do what is needed to right the ship and grow the business again. Steve Jobs’ return to Apple Computer is a great example of this. See my November, 2011 blog for that story. 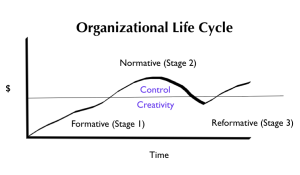 To short-circuit this decline scenario, Miller advocates a healthy balance of creativity and control during both the formative and normative phases of an organization’s life. With balanced leadership in place, the reformative stage can hopefully be avoided altogether. I have just taken you on an organizational life cycle journey to help you see possible future destinations, and remember where you have fit best in the past. Reference this model as you leverage your self-assessments, market research and networking to build a bridge to your next career opportunity. Do you prefer the more formative organization where you wear many hats, create solutions with limited resources, operate with more creative freedom, and share space with leaders who at times resemble barbarians and prophets? Do you prefer instead a more mature organization that offers more resources, sophistication and career options, but perhaps less creative freedom, more office politics and a more narrow role? Are you a transformational leader who is excited by the creative challenges of organizational reform, even with the heavy lifting that comes with it? How will you discover what’s next for you? First, learn the lessons from your career history. After that, consider the pros and cons of the formative, normative and reformative options I have described in this blog, and pursue whatever fits you best. Good luck finding your fit!